The Ultra™ Latch Storage Box line is ideal for those customers who want the ability to quickly identify contents yet need a durable storage solution. The innovative latch design secures the lid to the base, providing a rugged and comfortable grip surface, while keeping items safely stored inside. The recessed lids allow same size storage boxes to stack neatly on top of each other to use vertical storage space efficiently. The 18 Quart Ultra™ Storage Box is the ideal size for storing shoes, accessories, toys, crafts and household supplies, and fits conveniently on 16” wire shelving, to keep closets, basements, and attics organized. The 18 Qt and 30 Qt Ultra Latch Boxes use the same lid, allowing both the shallow and deep sizes to be stacked in same footprint. The overall assembled dimensions for this item are 18 1/8" x 12 1/4" x 7". Overall Assembled Size: 18 1/8" x 12 1/4" x 7"
Ideal for organizing small accessories like scarves, hats, belts, shoes, and more on shelves. 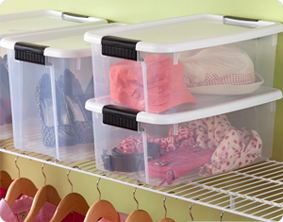 Durable Ultra™ Clears are a great storage solution for garages and basements. 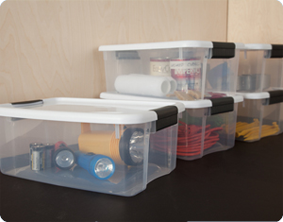 Organize flashlights, tools and other supplies on your workbench and make them easier to find. 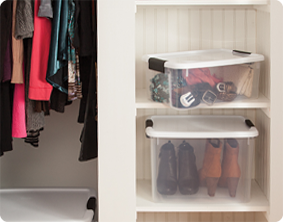 Keep smaller items neatly contained and protected in your closets. 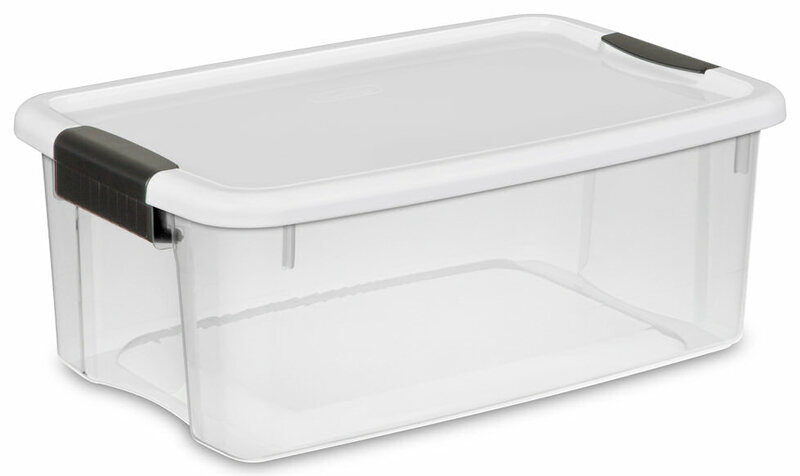 18 Quart Ultra Storage Box is rated 3.0 out of 5 by 4. Rated 1 out of 5 by Zeke77 from Dimensions are incorrect Purchased this specifically to store 18 inch rulers for my hobbies. Dimensions listed as 18 1/8" L X 12 3/4" W X 7" H (46 cm L X 31.1 cm W X 17.8 cm H). The one I purchased was 17 1/2" L X 11 3/4" W X 7" H. (44 cm L X 29.8 cm W X 17.8 cm H). Dimensions were short, making the container unsuitable for my purposes. Rated 1 out of 5 by Rob from Missing latch Purchased this item to use as grandson's toy box. Latch was missing. Didn't notice until we got home after purchasing at a store from out of state. Rated 5 out of 5 by nkhuong from Good for general storage Quality material and construction. Mine come with red latches instead of grey as on the website picture. The lower height is probably so you can stack more of these at once. The smaller sides have less of a curve so you can fit more stuff inside. Carrying around may be tricky through narrow doors or stairs. 2 should fit on the back of a regular 4door car but I think it a bit too wide for the front passenger seat. If you're looking to move around more frequently, I'd highly recommend looking at the 18 Gallon Latch and Carry Tote. It's the perfect size for moving around and the lid and construction material are also a bit better in my opinion. This is still a good product for its intended purpose, just make sure you understand your own needs. Rated 5 out of 5 by texasfisherman from This product works very well for my purpose I have used several different products similar to this one but with very little success until I found this one. It works very well, is the right size and has answered my storage problems. I use it in an enclosed lockable cabinet (metal) to store fishing gear. I use it for spare reels, line, various baits and terminal tackle. I have not one complaint on this unit. For the amount invested, I do not think a better product exists at least for the purpose I have put it to use.